Red light cameras across the District have been triggered by cyclists more than 1,500 times, but the cycling community said it is not right to classify them all as bad cyclists. A group of cycling advocates showed the handlebar perspective of getting around D.C., revealing plenty of challenges for riders. Bike lanes that disappear and reappear blocks later, inconsistent traffic signals, and drivers who don’t pay attention or are unaware of cyclists make riders fearful about traveling in Washington. 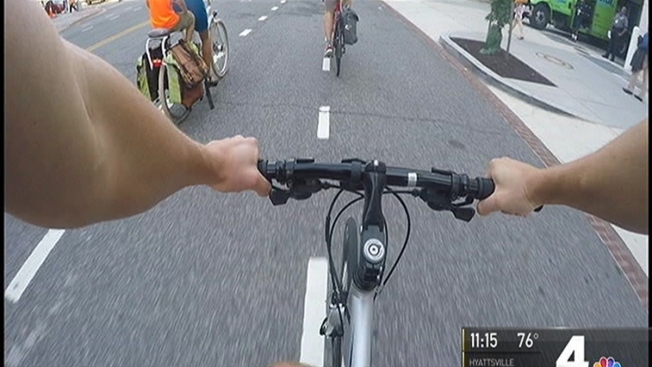 During a ride with advocates, helmet cam video showed a car attempted to pass another car on Pennsylvania Avenue and hit the barrier separating the bike lane from the traffic lane. The car then came very close to crossing over and entering the bike lane. "If a 16-year-old is texting on their phone and they aren't looking up, it doesn't matter if I'm stopped at a stop light or stop sign,” said Nelle Pierson, with Washington Area Bicyclist Association. “It doesn't matter if I'm in a bike lane or not. I'm at jeopardy." Cyclists feel like they are not always given the same protection from danger as cars. Many are always thinking about the threat of being hit by a car. "One of the big issues that we see and we hear from people about why they don't bike is that they just don't feel safe," said Greg Billing, with WABA. Advocates and cyclists said safer design of roads is a must, but a better understanding of one another also key. "Somehow, it's become a thing where people have each other in their sights,” said cyclist Dave Sallavesh. “It's cars versus bikes, bike versus cars. It's really all people trying to get to and from work, trying to get to and from places they go." The WABA said if drivers really want to make cyclists happy, communicate. Cycling advocates said there are other bicyclists that break the rules, and those people shouldn't do that. But they argued drivers can't simply lump all cyclists into one category as bad cyclists, just like all drivers shouldn’t be lumped together as bad because one got into an accident. They said all cyclists and drivers need to brush up on street safety to gain a better understanding between the two groups and the changing roadways in the District. "When you get your drivers licenses at 16 or 18, you have it for the rest of your life,” Billing said. “We don't give people a chance to intervene about how the streets have changed. The streets look very different from 20 years ago." Currently, D.C. has 75 miles of bike lanes. Another 125 miles are in the works.